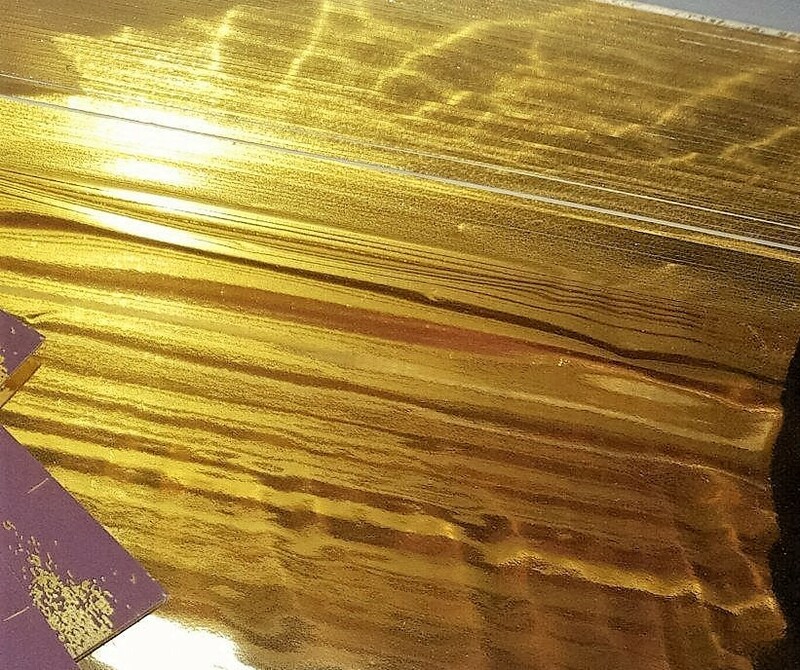 We have been busy getting gold on our hands here at Watermarx, with our clients showing a sudden flurry of enthusiasm for edge gilding on their high-end jobs. Lot’s of finery and fun! Gilding is an embellishment we offer our clients as a value-add for their jobs and it works across a huge spectrum of pieces, for all different purposes. The shimmery foil edge gives a piece personality and something a bit special. It’s an ancient technique used even way back by the pharaohs, to suggest a hint of luxury. It will upgrade the whole look and feel of the job, and we joke that it’s a champagne upgrade for those on a beer budget. 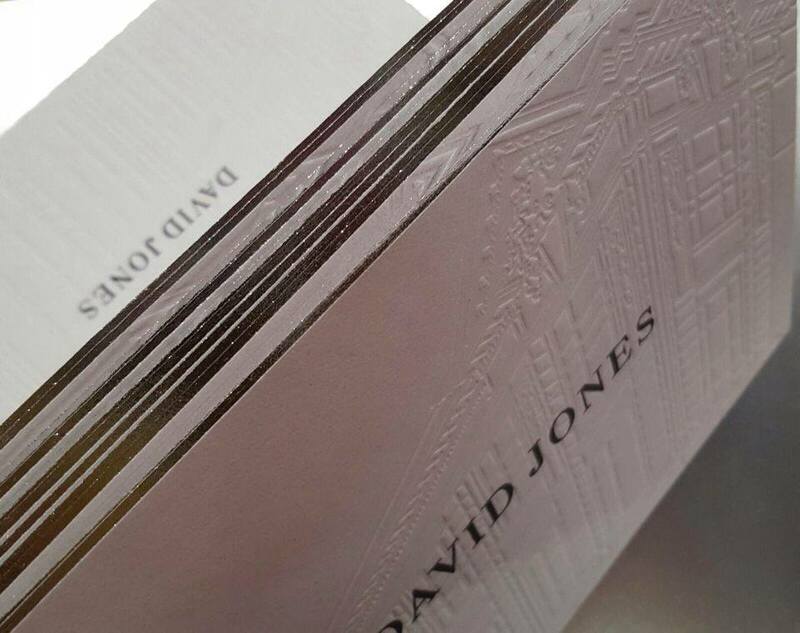 We will gild (almost) anything starting from business cards, to A6 sizes and above, to add that extra va-va-voom! 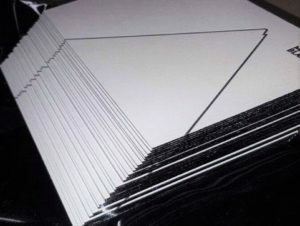 First, we prepare our sheets to be sure that the edges are ultra-smooth and dust-free, then we apply a thin layer of foil along the edge of the stacked, cut pieces and file it back. That’s why you can’t have colour bleed off the edge, because the print quality can be scuffed or made furry after we sand the gilding back to finish. If you’re looking for a little je ne sais quoi for your next job, chat to us about this special feature, and be sure to read our tips below to help you best design the glam factor of gilding, in the most cost-effective way. Shakespeare is often attributed with popularising the phrase “don’t gild the lily”, which means to add or embellish something that is already naturally beautiful. In this case, though, we have found that edge gilding can transform a simple job that is lacking a distinction, and inexpensively take the whole piece to a new level, giving it a much more premium look and feel. In big news across the ditch, the first David Jones store opened in Wellington, New Zealand a week and a half ago, and we had a lot of fun helping produce the invitations for their launch event. The touch of gold must have brought good luck because the New Zealand media keep reporting record sales! Read more about Watermarx Graphics gilding here. This entry was posted on Tuesday, August 9th, 2016 at 4:11 pm	and is filed under Foil Stamping, Gilding, Invitations, Letterpress, Watermarx, Wedding Invitations. You can follow any responses to this entry through the RSS 2.0 feed. Both comments and pings are currently closed.